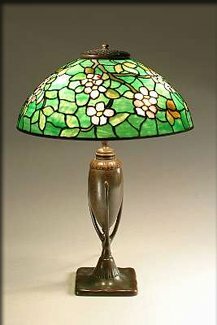 Attractive "Apple Blossom," 16 inch shade, pattern table lamp on an upscale base. These are very desirable lamps, and not easy to find. They have a pleasant color palette, and blend in well with many color schemes. The base is a "Crutch" style, model #444.